Frances Tiafoe fools David Goffin on Tuesday at the Miami Open presented by Itau. Photo: Mike Lawrence/ATP Tour. Watch ATP Tour tennis streams live & on-demand on Tennis TV. Denis Shapovalov smashes a forehand winner against Stefanos Tsitsipas at the Miami Open presented by Itau. Watch live tennis streams at http://www.tennistv.com. Denis Shapovalov reflects on beating eighth seed Stefanos Tsitsipas on Tuesday at the Miami Open presented by Itau. Watch live tennis streams at http://www.tennistv.com. Watch Stefanos Tsitsipas unload on a backhand winner against Denis Shapovalov at the Miami Open presented by Itau. Photo: Julian Finney/Getty Images. Watch live tennis streams at http://www.tennistv.com. David Goffin hits a perfect touch volley against Frances Tiafoe on Tuesday at the Miami Open presented by Itau. Photo: Mike Lawrence/ATP Tour. Watch live tennis streams at http://www.tennistv.com. Roberto Bautista Agut hits a delicate topspin lob over Novak Djokovic's head at the Miami Open presented by Itau. Photo Credit: Mike Lawrence/ATP Tour. Watch live tennis streams at http://www.tennistv.com. Roberto Bautista Agut had every reason to be pleased with his comeback win over top seed Novak Djokovic at the Miami Open presented by Itau. Watch live tennis streams at http://www.tennistv.com. Watch as Roberto Bautista Agut takes out top seed and six-time champion Novak Djokovic at the Miami Open presented by Itau. Photo: Julian Finney/Getty Images. Watch live tennis streams at http://www.tennistv.com. Jordan Thompson hits a picture-perfect lob against Grigor Dimitrov at the Miami Open presented by Itau. Photo: Julian Finney/Getty Images. Watch live tennis streams at http://www.tennistv.com. Frances Tiafoe delivers the goods in a crucial moment against David Ferrer at the Miami Open presented by Itau. Photo: Peter Staples/Miami Open. Watch live tennis streams at http://www.tennistv.com. Not even David Ferrer could chase down this delicate drop volley from Frances Tiafoe at the Miami Open presented by Itau. Photo: Peter Staples/Miami Open. Watch live tennis streams at http://www.tennistv.com. 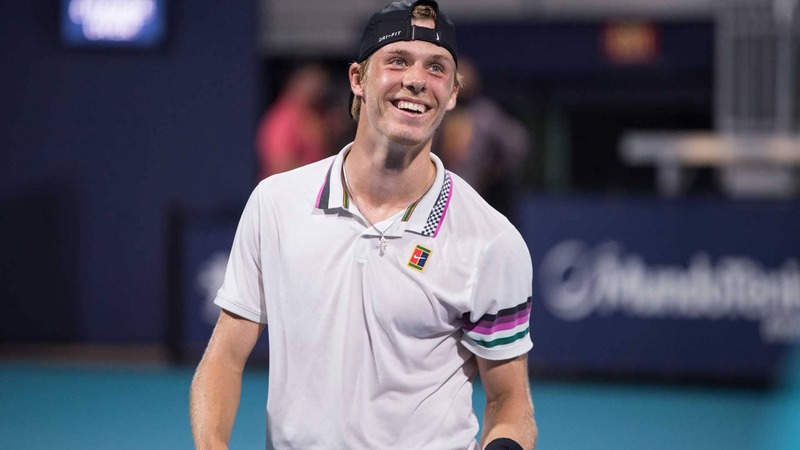 Denis Shapovalov had plenty of reason to be pleased with his performance to reach the fourth round at the Miami Open presented by Itau. Watch live tennis streams at http://www.tennistv.com. Watch as Stefanos Tsitsipas hits a drop volley so short that it nearly causes Leonardo Mayer to tumble over the net at the Miami Open presented by Itau. Photo: Peter Staples/Miami Open. Watch live tennis streams at http://www.tennistv.com. David Ferrer scrambles all over the court before producing a great winner against Frances Tiafoe at the Miami Open presented by Itau. Photo: Al Bello/Getty Images. Watch live tennis streams at http://www.tennistv.com. Denis Shapovalov goes toe-to-toe with Andrey Rublev and comes out on top at the Miami Open presented by Itau. Photo: Michael Reaves/Getty Images. Watch live tennis streams at http://www.tennistv.com. Grigor Dimitrov, John Isner, Radu Albot and Jeremy Chardy and Steve Johnson all are puzzled by the headlines caused by "Florida Man". Roger Federer believes his form is getting better each day at the Miami Open presented by Itau. Watch live tennis streams at http://www.tennistv.com. Watch as Filip Krajinovic turns a flick of the wrist into a gorgeous passing shot against Roger Federer at the Miami Open presented by Itau. Photo: Yong Neck Lim/Getty Images. Watch live tennis streams at http://www.tennistv.com. Watch as Roger Federer holds off a challenge from Filip Krajinovic in their third-round clash at the Miami Open presented by Itau. Photo: Peter Staples/Miami Open. Watch live tennis streams at http://www.tennistv.com. Roger Federer takes advantage of his opportunity in a grueling rally with Filip Krajinovic at the Miami Open presented by Itau. Photo: Peter Staples/Miami Open. Watch live tennis streams at http://www.tennistv.com.